First published in 1938, this title presents the greater part of the 1933 Gifford Lectures in natural theology, given by Edwyn Bevan. The questions raised regarding the element of symbolism in religious conceptions takes the reader to the very heart of the religious problem, and addresses some of the most fundamental questions posed by theology and comparative religion: the nature of ‘Spirit’; the spiritual efficacy of sacred histories and the images they utilise, in particular those found in the Bible; the ambiguous role of language, not only in relation to God but also to the world around us; and the uncertainties pertaining to ‘rationalism’ and ‘mysticism’. 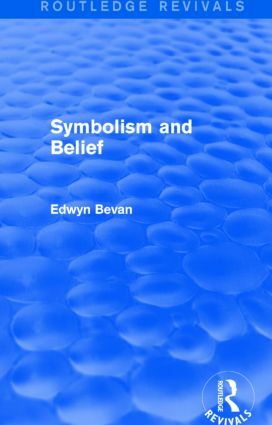 Symbolism and Belief offers the student of theology, philosophy, scriptural exegesis and anthropology a wide-ranging resource for the study of religious discourse.